Drivers will now be able to experience the high-performance, luxurious, and high-tech features of the S-Class with the sun shining down on them. 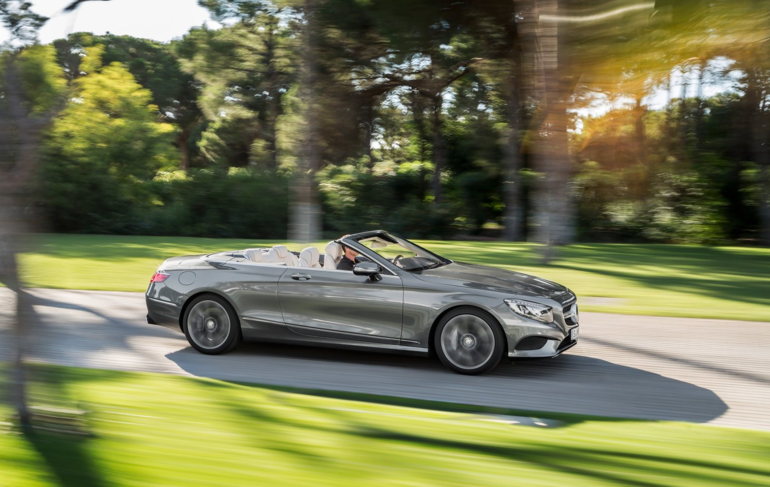 Mercedes-Benz introduced the S-Class Cabriolet at the 2015 Frankfurt Auto Show. The Cabriolet offers seating for four passengers within a spacious cabin. When the soft-top is lowered into the trunk, a cover tray is automatically put in place to cover the cloth. The top is able to retract in less than 20 seconds when the driver is driving at a maximum speed of 37 mph. The Cabriolet’s stiffness is upheld even though the materials are far more lightweight. Mercedes-Benz wanted to maintain comfort for all passengers no matter if the top is up or down. The AirScarf system releases warm air towards the neck area of passengers so they can maintain a warm temperature with the top down. Silver Star Mercedes-Benz Montreal does not want to forget to mention the power behind the Cabriolet. The standard turbocharged 4.7-liter V-8 engine under the hood delivers 449 horsepower and 516 pound-feet of torque. Buyers even have the option to upgrade the engine to a 5.5-liter in order to raise the horsepower to 577 ponies.